Simba's evil uncle and brother of Mufasa. After Mufasa's death and Simba's disappearance, Scar became king of the Pride Lands and used the hyenas to do his dirty work. Scar hasn't taken care of the Pride Lands, and almost all the animals have been forced to leave. The younger brother of King Mufasa and Simba's uncle. Scar is an antagonist in Kingdom Hearts II. 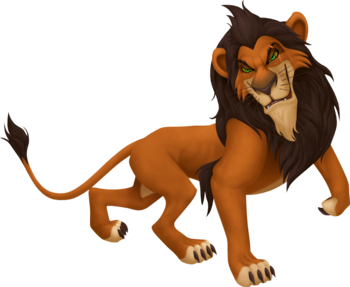 He is Simba's evil uncle, and was jealous of the admiration and power his older brother Mufasa received, so he killed him in order to take his place as king of the Pride Lands. Scar eventually becomes a Heartless, but retains his appearance and personality. He originates from the Disney film The Lion King. Having killed Mufasa to take control of the Pride Lands as its king, Scar teams up with Pete as a way to rule the kingdom with discipline. When Scar first meets Sora, Donald, and Goofy at Pride Rock, he wishes to eat them, as there is little food in the Pride Lands because of his shoddy treatment of them, but the trio escape and convince Simba to return to Pride Rock. Scar about to fight Sora and his allies. When this occurs, an overconfident Scar reveals the truth about Mufasa's death, enraging Simba and prompting him to chase after his murderous uncle. While Sora, Donald, Goofy, Timon and Pumbaa hold off the hyenas, Simba fights Scar at the top of Pride Rock. Sora and his allies arrive in time to watch Simba throw the pretender to the throne off the cliff, but Pete arrives and tells them that because of the anger and jealousy within his heart, Scar has become a Heartless. A battle ensues as Scar climbs back up to the peak, with Sora and his friends victorious. The Ghost of Scar taunts Simba. In the second visit to the Pride Lands, Scar appears as a dark ghost that haunts Simba, taunting him and saying he will never be a true king. The ghost lives as long as Simba has doubt in his heart. Eventually, Simba retreats to the oasis in the jungle, but Scar's ghost confronts him there as well. With the help of Sora, Donald, and Goofy, Simba stands up to the ghost and it disappears. The victory is short-lived, however, when Timon arrives and tells them that Scar's ghosts are all over the Pride Lands and everyone but Nala has escaped. The group returns to the Pride Lands and Simba saves Nala from the ghost. Immediately afterwards, all of the ghosts merge in the Savannah and become the enormous Groundshaker Heartless. Sora and Simba fight the giant Heartless and emerge victorious, as the ghost of Scar is finally gone. 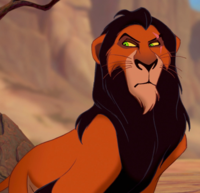 Scar is depicted as a cold, ruthless, brutal, and merciless tyrant whose sole goal is to be the ruler of the Pride Lands. The lives of his subjects and even of his family mean nothing to him. To that end, he is willing to put whatever he pleases on the line, and kill anyone who gets in his way. This is seen when he murders Mufasa in cold blood. He is also shown to be arrogant and overconfident, as seen when he foolishly admits to killing Mufasa, a trait which proves to be his downfall as he ultimately pushes Simba too far. Scar is an adult lion with brown fur and a thin, silky, coal black mane. The fur on his belly, the bottoms of his paws, and around his mouth is light tan and when compared to his nephew and older brother he is quite lanky and frail. There are short tufts of black fur on the back of his elbows, as well as on on the tip of his tail, and he has sharp, dark brown claws. Scar's name obviously refers to the scar he has over his left eye. His eyes are striking yellow green and his sclera are yellow, while his eyebrows are the same color as his mane, black. He has a widow's peak and his large, round ears are partially visible through his mane. He has ten dark whiskers, five on either side of his upper lip. He also features a goatee on his chin. Scar, formerly known as Prince Taka, originates from the Disney 1994 film The Lion King, voiced by Academy Award winner Jeremy Irons. At the beginning of the film, Scar did not attend Mufasa's new-born cub Simba's presentation to the kingdom, much to Mufasa's disappointment. Resentful about having lost the throne to the Pride Lands to his older brother and now to his nephew, the next rightful heir, Scar's jealousy for the both of them intensifies over the years as he plots to kill them. In order to accomplish this, he begins to build an army of hyenas by bribing them with food. When a young Simba and Nala journey to the Elephant Graveyard, Scar sends his hyenas, Shenzi, Banzai and Ed, to eat them, but watches with displeasure as his plan was foiled by the timely arrival of Mufasa. Afterwards, he lures Simba into a gorge where a pack of wildebeest were migrating through. Mufasa was able to save Simba from being trampled to death, but he was struggling on the edge a cliff, where Scar confronts his brother and reveals his evil intentions before flinging Mufasa to his death in the stampede. Scar tricks Simba into running away from the Pride Lands by making him believe that it was his fault Mufasa died. Simba does so, and Scar then sics his hyenas after him to guarantee Simba's death. Scar took over the Pride Lands, using the hyenas to ensure his reign goes undisputed. Under his tyranny, the Pride Lands became overrun by hyenas, and the excess of predators drove the herds away, while a drought deprived them of water. In addition, he passes a law to prevent the subjects from speaking about Mufasa. In spite of near starvation, Scar forbids anyone from leaving the Pride Lands. A few years later, an adult Simba returns to the Pride Lands to reclaim the throne from Scar. Upon seeing his nephew alive (the hyenas lied to him that they killed Simba), a shocked Scar feigns relief of his nephew's survival and forces Simba to admit that he is responsible for his father's death. Scar backs Simba to edge of a cliff and reveals to him that he was truly responsible for Mufasa's death. Enraged, Simba coerces him into confessing the truth to the entire clan. In an act of desperation to preserve his life, Scar tries to blame the hyenas for Mufasa's death. When Simba chooses to exile Scar rather than kill him, Scar appears to concede, but then blinds his nephew by brushing embers into his face and fights his nephew. After a fierce battle between the two, Scar is thrown off a cliff and survives the fall, but is then mauled to death by the hyenas whom he had previously betrayed. When Sora first meets Pete in the Pride Lands his journal entry mentions "Scar's Phantom", before the Phantoms actually appear. Scar is one of two Disney characters to become a basic enemy type, the other being the Magic Mirror who became an Unversed. Scar is the only Disney villain in Kingdom Hearts II who Pete was successful in turning into a Heartless.